classic and popular davies 1900 clone abs plastic knob, used on many eurorack and other synth module..
popular knobs similar to 'make noise' and 'mutable' modulesskirted types available black with white ..
song huei 9mm panel trimmer potsknurled black plastic shaft white line indicator (except where indic..
slider pot / toggle switch capcolor caps suitable for slider pots and mini toggle switchesthese will..
Altered States is a dual analog state variable filter in a 20hp module. The filter cores are 12db/oct and based around the clean and reliable 2164 Quad VCA chipset. They offer full voltage control over cutoff frequency and resonance as well as individual outputs for each filter type, including a variable state output with both manual and voltage control. 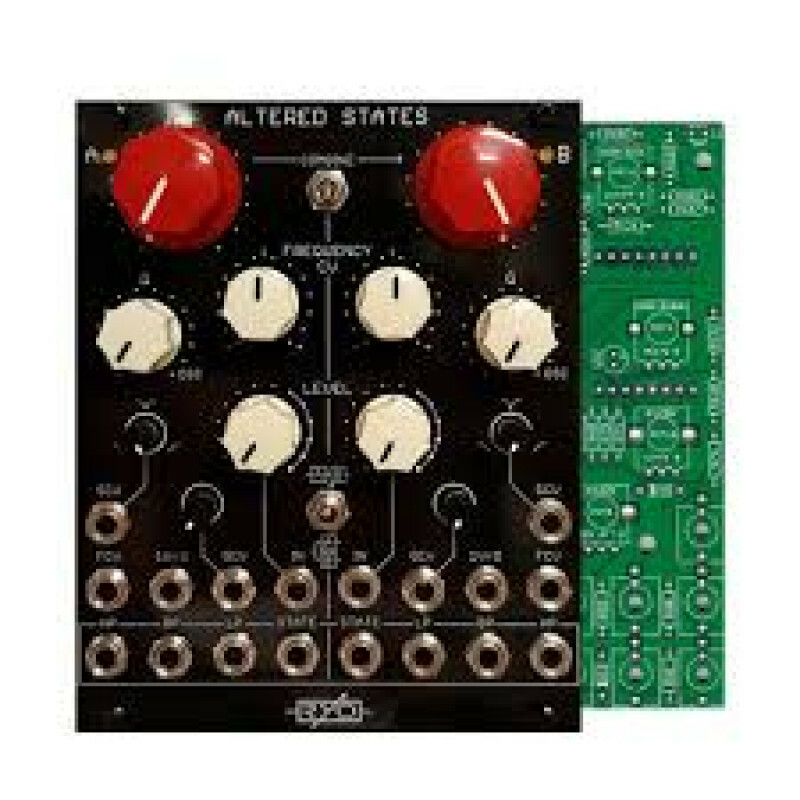 Altered States is a highly versatile dual filter, the input and resonance controls have plenty of range to dial in anything from smooth and clean to harsh, overdriven and screaming resonant tones. The cores are very stable and will give you around 5 octaves of 1V/O tracking sine wave self-oscillation; the LP, BP and HP outputs each have a different phased sine. The state outputs offer seamless fading between lowpass and highpass filter response, with an all-pass/notch response around 50% of the knob setting. With voltage control available on frequency cutoff as well as on resonance and state outs, the Altered States is perfectly suited for the modular environment. The filters can be combined (linking the filter B frequency cutoff controls to filter A), and can be set to either serial or parallel input routing.